This week saw a new digital diplomacy milestone, with the first live webchat featuring EU Ambassador to the USA João Vale de Almeida (@ValedeAlmeidaEU) and US Ambassador to the EU William Kennard (@USAmbEU). 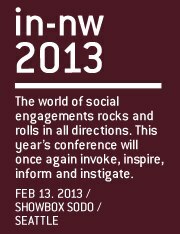 I had the opportunity this week to rub shoulders with some of the key figures in the digital media scene from Seattle and further afield at the in-nw 2013 conference (“Current and future landscape of social engagement”). I’m grateful to the team who run the University of Washington’s Master of Communication in Digital Media for allowing me to come along with them to the conference. Network theory and power law have been the focus of attention in the University of Washington’s Digital Media and Politics course during the last couple of weeks. This might sound rather academic, but I think the theoretical background can provide some useful insights into the challenges we face communicating the European Union.